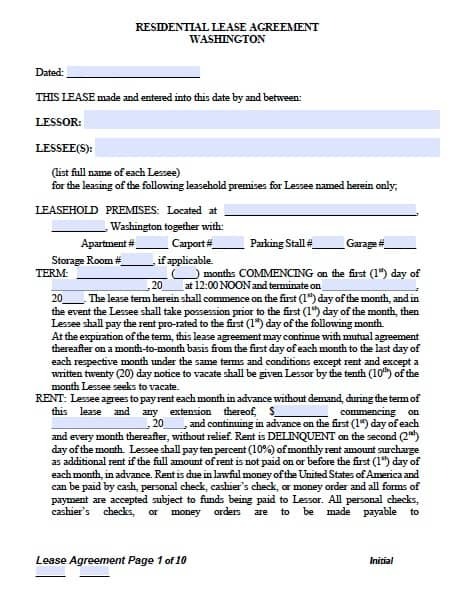 The Washington standard residential lease agreement is a template that a property owner may use to legally accept payment for someone else occupying their property. The tenant usually has to apply and hand over the landlord his or her credit information to make sure that they are qualified for the monthly payment. If approved, the landlord will fill in the blanks of this form with the agreed upon arrangement. After signature and the security deposit have been made access to the property will be given including keys and any codes required to get in to the living unit. If the residence was constructed prior to 1978, the lead based paint disclosure form is required for the tenant to sign. After signature it should be attached to the contract. As per State law, if the landlord accepts a Security Deposit for the rental unit the move in checklist must be filled out by the tenant in order to help protect from unnecessary deductions.